Image: Boxwork in Wind Cave, SD, USA. ro: filonete (n) de calcit ? 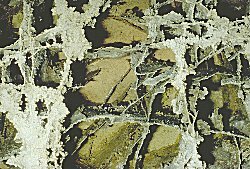 Boxwork are thin plates of calcite forming boxes. The first step to the forming of boxwork are thin cracks in the limestone, a result of tectonic forces (e.g. uplift). This fissures have two or more main directions, depending on the direction of the force that produced them. Groundwater filling the cracks transports calcite from the surrounding limestone into the cracks and depostits the calcite as calcite crystals. Later, when the cave grows, the ceiling or the wall of a cavern consits of this limestone with its healed cracks. Unter certain circumstances the limestone is eroded, and normaly the erosion of limestone is faster than the erosion of the more inert calcite crystals. So it is rather easy to understand how the is formed. The boxwork on the photo is from Wind Cave in the Black Hills, SD, USA. Many caves in the Black Hills have boxwork, but the boxwork in the Wind Cave is the most beautiful and the largest of the world. The boxes are about 15cm wide and 30cm deep.